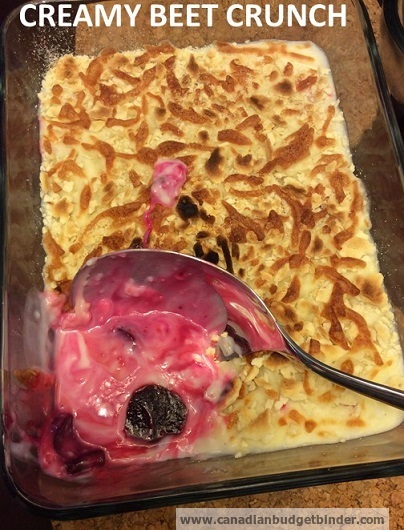 We often joke about making a casserole on the Canadian Budget Binder Facebook page and in some ways today’s recipe is just that and we’re using delicious beets. The best part about beets is that this time of year you can buy them at the grocery store for a great price. If you fancy growing your own beets there are many varieties that you can consider. Beets can be grown as your standard red or deep purple colour or even a golden-yellow or white beet. The varieties of beets differ around the world but some of the most popular beets are “Albino, Early Wonder, Red Ace and Ruby Queen just to name a few. We love beets in our family any way we can get them but the tough part is coming up with beet recipes that provide variety for my family. When using beets be warned that you will need to wear gloves because the red colour from the beets will soak into your skin. It takes a bit of scrubbing but eventually will come out. You just don’t want to have red fingers when you go to work or out for the evening. Beets also known as one of the world’s healthiest foods are an excellent source of folate, vitamin C, fibre, copper, potassium, phosphorus, magnesium, iron, Vitamin B6 and manganese. In just one cup of cooked beets you will find these and many other nutrients as well as only 75 calories. If you eat too many beets don’t be surprised if you see the color red for a day or so because the pigment does not break down in our bodies. Unknown to many you can eat the leafy greens which taste like spinach or other greens you can easily boil, steam or saute with some garlic, salt and pepper for a lovely side dish. Beets are very popular in Eastern and Central European countries especially in a beet soup called borscht. Borscht is of Ukrainian origin and is served with a dollop of sour cream on top. Other uses for beets that are common are your pickled beets which you can easily find at any grocery store and are very cheap. You can pick up a one litre jar of pickled beets for about $1.99 or make them yourself if you fancy canning. Most people enjoy the pickled beets on their own or in a salad. I know Mr.CBB has made a beet salad dressing compliments of our dear friend Beth at Aunt B on a Budget and he loved it so that’s another alternative use for beets. You can also serve roasted beets or cooked beets with butter and salt on top. Some people even enjoy raw beets. There are many recipes for beets out there but today I wanted to focus on cooked beet recipes. Summer is in full swing which means the heat can control just how much cooking some of us do in the kitchen. The temperatures here have been crazy hot and nobody has wanted to eat or do much let alone go outside. I didn’t really want to cook much this week so we have eaten plenty of cold dishes and snacks during the day so at least we get a good meal at night. Even at night we haven’t had big meals but because the boys have football training I tend to make their dinner a bit earlier so that they are not running about on full stomachs. With all the talk of gardens and vegetables this time of year I was intrigued to create a new recipe with my beets rather than just making the standard pickled beets. Don’t get me wrong I love pickled beets especially in a cold beet salad or even baked in the oven like today’s dish but I wanted something more. Since speaking with the Canadian Budget Binder What’s For Dinner ladies (5pm-10pm join us on Facebook for foodie chat) I didn’t even realize that you could use and cook the whole beets including the leafy beet greens. My friend Pat also mentioned a very traditional Ukrainian dish called Beet Rolls where you use the beet leaves and fill them with bread dough and rice and serve in a creamy dill sauce. That sounded interesting as my lot here love dill with anything. Definitely a beet recipe that I will put on my to-do list of cooking! The beet leaves are apparently just like Swiss chard and spinach. This got me thinking a bit and I ended up creating a lovely beet leaves stir-fry using the beet leaves which I will share with you soon so keep an eye out for that recipe. Today though I am going to be concentrating on the beets themselves and giving you my mom’s recipe for a Creamy Beet Crunch dish that you can enjoy as a meatless side-dish. This baked beet dish is loaded and layered with a lovely white bechamel sauce (a simple creamy sauce with nutmeg), mozzarella cheese and topped with chips and crackers. You can make the bechamel sauce on the stove-top or in the microwave like I have today. My mom makes this often at home and usually serves it alongside chicken or fish to complete the meal. If you are a beet lover you will enjoy the variety in this cooked beet recipe as a lovely side-dish for your chicken or fish. Make bechamel sauce or white sauce by adding the milk and butter into a glass measuring cup. Simply add the ingredients into a glass measuring cup and microwave until combined. Add the flour gradually whisking until thick. Depending on the flour you may need to add a little more milk to thin it out. If it is thick add more milk and put back in microwave for a further minute. Add nutmeg the nutmeg at the end. You can also make the bechamel sauce using the stove-top method. You will find a link in the blog post above to Mario Batali from the Food Network. Now peel the beetroot and thinly slice and place in the bottom of your baking dish. Pour the bechamel sauce over the cooked sliced beets ensuring that all the beetroot is covered. Mix together the mozzarella cheese and crackers/potato chips and cover the sauce. Place under the grill until brown and bubbly about 10-15 minutes. So if you have an abundance of beets hanging around your house or you just want to try a new beet recipe give this cheesy, creamy beet crunch side-dish a try. Let me know what you think and if you made any changes to the recipe that I might want to try. Got some beets but it’s called golden beets here in our country ready for harvest in our small garden. We normally add beets to salad with a good dressing and just grill it. Your recipe on Creamy Beet Crunch looks so delicious. It kinda looks similar to lasagna at first. It’s a must-try!